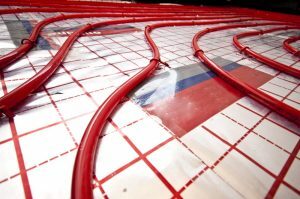 Here’s What You Need to Know About In-Floor Heating | Atlantic Refrigeration and Air Conditioning, Inc.
Before we even talk about HVAC, let’s define what “radiant heat” means from a scientific perspective. This kind of heat is found everywhere: it’s the warmth you feel from the sun or from a bowl of hot soup. This is different than forced-air heating, the heating method used by furnaces and heat pumps. Forced-air uses the air as the medium for transferring heat. That means these systems must rely on blowing air into a room in order to warm it up. For radiant systems, the heat is transferred via electromagnetic waves. While it does have to pass through the air in order to warm you up, it does not actively heat the air itself. In this application, the tubes are connected to a boiler. The boiler heats the water, and that water runs through all the tubes. This process, called hydronic heating, creates radiant heat. If you don’t have access to natural gas or don’t want to install a boiler, you can also go for electric in-floor heating. Rather than using tubes, these systems use panels or cables to achieve a similar effect. They’re just as effective, but they may be expensive based on the costs of electricity in your area. Radiant systems are said to be the most comfortable heating systems out there. However, if they were perfect, then we wouldn’t have a need for other kinds of heaters. Let’s break down some of the pros and cons of these systems. Less maintenance: Since these systems have very few moving parts, they tend to last a long time and rarely have issues. Even heating: Thanks to how the heating components are laid out through the floor, the entire room can be evenly heated. The same cannot be said for forced-air heaters. Better air quality: These systems do not need to blow air through the room, making them great heaters for those who suffer from allergies and asthma. Slow to heat: One of forced-air heating’s main benefits is how fast they’re able to heat up. Unfortunately, in-floor heating can’t compare. Inconvenient installation: Unless you’re building a house or renovating rooms, you’ll have to rip up the floors just to install this system. For some, that may be a bit inconvenient. Boiler might be required: If you don’t want to use electric in-floor heating, you’ll have to get a boiler, which will come with its own costs. Contact Atlantic Heating and Air today to learn more about radiant systems.